January was the biggest month yet for marijuana legalization! California opened the world’s biggest legal pot market, and Vermont’s state legislature became the first to legalize marijuana. January 2018 was the most important month yet for marijuana legalization. Things looked rocky a few days into the month, when Attorney General Jeff Sessions, rescinded an Obama-era memo that protected states that had legalized marijuana from federal interference. Because cannabis remains illegal at the federal level, the federal government can still crack down on pot even in states where it’s legal under state law for recreational purposes. But the announcement came and went with little sign that the Justice Department will actually do much in its new war on marijuana. The agency was unclear when reporters asked if the move will actually lead to more anti-marijuana prosecutions. And in the aftermath, federal prosecutors across the country released statements that were either vague or indicated that they won’t lead to a new wave of anti-marijuana crackdowns in places where pot is legal under state law. Meanwhile, California at the beginning of the month opened the world’s biggest legal market for recreational marijuana — following voters’ decision in 2016 to legalize pot for recreational purposes and allow sales of the drug. Then, after Sessions announced his new marijuana policy, Vermont legislators, with the support of Republican Gov. Phil Scott, legalized marijuana for recreational use. The law won’t allow sales — only possession and growing. But it’s a big move because Vermont is now the first state to have legalized marijuana through its legislature. All of this adds up to a huge month for marijuana legalization. If even a federal threat over marijuana legalization didn’t stop Vermont’s legalization momentum or slow down California’s massive new legal pot market, what, if anything, will stop more states from going down the same path? January 1 was perhaps the single biggest day for marijuana legalization yet. On that day, the country’s most populous state — and the world’s sixth-largest economy — officially launched an entirely new industry within its borders. According to state estimates, more than 400 businesses were licensed as of January 1. Since then, and despite Sessions’s new marijuana policy, more cities — including Los Angeles, the most populous in California — began letting businesses sell cannabis for recreational use, adding dozens more approved licenses to the state’s total. The growth is expected to continue. GreenWave Advisors, a cannabis financial analyst, estimated that California’s industry could be worth $5.1 billion in 2018. One report from researchers at the investment bank Cowen estimated that legalization in California alone would triple the size of the nation’s legal pot industry within a decade. It may be easy to dismiss what California did because of the state’s previous medical marijuana system, in which just about anyone could stroll down to Venice Beach in Los Angeles, pay $40 or so for a medical marijuana card, and legally buy some cannabis. But there is a vast difference in scale between Venice Beach’s local medical pot shops and the burgeoning multi-state marijuana industry that can arise from full legalization. The consequences will be not just economic, but political too. The new big marijuana industry, just like any other for-profit industry, wants to grow. 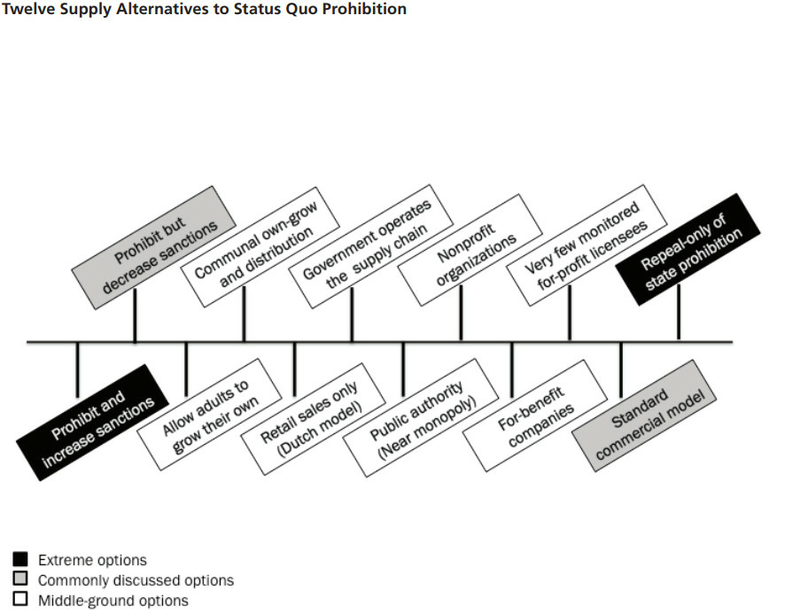 The obvious pathway to doing that is legalizing pot in the dozens of states where it remains illegal. With many more customers thanks to California’s decision alone, the industry will have more profits to carry out the political campaigning and lobbying it needs to achieve this. This is, in fact, what legalization advocates have long expected: The marijuana industry will increasingly play more and more of a role in the drug policy reform movement as legalization spreads. The big problem with ballot initiatives is not a lack of public support. 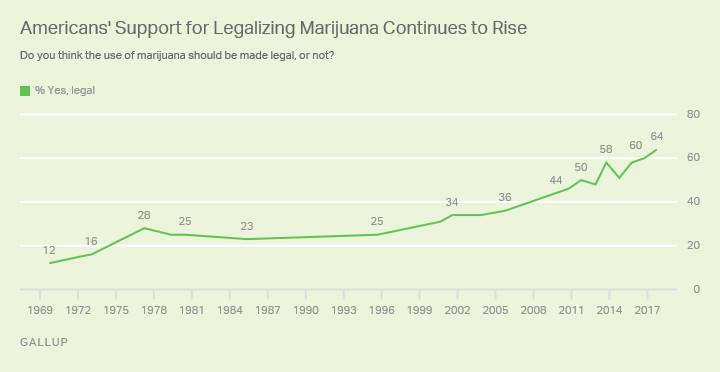 Based on surveys from Gallup and the Pew Research Center, at least 60 percent of US adults support legalization if asked in a yes-or-no poll about it. Even a poll conducted for the anti-legalization group Smart Approaches to Marijuana, which added nuance to the issue by asking people what their preference was between medical legalization, decriminalization, full legalization, and keeping current federal policy, found that 49 percent support full legalization — by far the biggest group of responders in the poll. Instead, the problem has long been that ballot initiatives can cost a lot of money. Whenever I ask legal pot activists why, for example, it took so long to get medical marijuana — which now polls very well virtually everywhere — in Ohio and Florida, the response is usually that those states are very expensive to run ballot initiatives in (partly because they’re relatively large and populous). Well, there’s now going to be a rapidly growing industry to cover those expenses. And that will likely lead to more victories in the ballot box and legislatures down the line. On January 22, Vermont became the first state to legalize marijuana through its legislature. Until this point, all states had legalized through a voter-approved ballot initiative. There are some caveats to the state’s decision. For one, it only allows adults 21 and older to possess up to an ounce of marijuana and grow up to two mature and four immature cannabis plants. Crucially, this means Vermont does not allow sales. If you ask experts, perhaps that’s fine. They have long pointed out that there are many ways to legalize marijuana. The way many states are doing it — allowing big companies to come in and market the drug — carries its own risks. See: tobacco, alcohol, and opioid companies’ long histories of irresponsibly marketing their products to get as many people as possible consuming and even addicted, no matter the public health risks. So many experts prefer alternatives to commercialization, including allowing just growing. In fact, experts pointed out that there are a full dozen possibilities for marijuana policy in a report to the Vermont legislature, spanning from increasing penalties on marijuana to allowing only growing to allowing only nonprofit sellers to commercialization to full repeal without any regulation. Many of the options short of commercialization would reduce the number of marijuana-related arrests — which are very racially skewed even though black and white people use pot at similar rates. But for many legalization advocates, the end goal has always been allowing sales. That’s the way, as they see it, to kill off the black market for marijuana that’s helped fund violent criminal organizations around the world. So Vermont’s decision isn’t a full victory for many advocates — and there still isn’t a state legislature that’s agreed to legalize cannabis sales. There are some signs that this could change soon. New Jersey’s new Democratic governor, Phil Murphy, wants to fully legalize marijuana. And Vermont legislators are already discussing legalizing sales, although the state’s Republican governor seems resistant. Regardless of where this all ends up, though, the short of it is that a state became the first this month to legalize marijuana through its legislature. That’s a big win for legal pot advocates no matter how it’s spun. The one wrinkle in January’s big news for marijuana legalization was Trump’s Justice Department. Earlier this month, Sessions announced that he was rescinding an Obama-era memo that effectively told states that they can move forward with marijuana legalization without the threat of federal interference. This guidance was big: Since federal law still prohibits marijuana for any use, the threat of federal interference is a potential threat to legalization. The Obama administration, though, said that the federal government would not interfere as long as states met certain criteria (such as not letting legal pot fall into kids’ hands), and federal enforcement of those criteria was fairly loose. Sessions took back the Obama-era memo. In doing this, he did not order federal prosecutors to crack down on legal marijuana. Instead, he told them that they could use their own judgment based on “previously established prosecutorial principles” — allowing them to crack down on legal pot, but not requiring it. The intention here was clear. Sessions has long been an opponent of legalization, previously claiming that “good people don’t smoke marijuana” and arguing that the federal government should use its law enforcement apparatus to shut down legal pot operations. “We need grown-ups in charge in Washington to say marijuana is not the kind of thing that ought to be legalized, it ought not to be minimized, that it’s, in fact, a very real danger,” he said as a senator in 2016. The vagueness of Sessions’s new guidance, though, left it up to individual prosecutors to decide whether they will take action against legal pot states. By and large, federal prosecutors seem to have responded with a shrug. US Attorney of the District of Colorado Bob Troyer indicated that nothing will change following Sessions’s announcement, saying in a statement that his office has “already been guided” by the principles laid out by Sessions. That doesn’t sound like the federal prosecutor in Colorado, the first state to allow legal pot sales, announcing a new policy. US Attorney of the District of Massachusetts Andrew Lelling released perhaps the most alarming statement for legal pot advocates, but even he was vague — stating that he “cannot, however, provide assurances that certain categories of participants in the state-level marijuana trade will be immune from federal prosecution.” That sounds like someone keeping his options open, not a declaration of war in Massachusetts, where pot was legalized in 2016. And, again, the Justice Department itself couldn’t answer whether the new policy will lead to more anti-marijuana prosecutions. This uncertainty could still have had an impact, potentially leading to a chilling effect on new marijuana businesses as well as lawmakers and activists looking to legalize pot. But based on what happened in Vermont and continued in California this month, that chilling effect remains theoretical. Legalization seems like it will continue chugging along — ringing in the biggest change to American drug policy in decades.